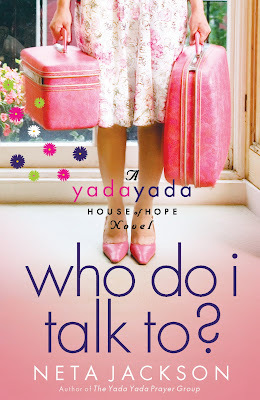 Audra Jennings: Who do I Talk to? I actually finished Who do I Talk to? last Saturday, but am just now writing the review because I'm somewhat lazy. I was determined to finish reading the book once I started between cooking last Wednesday. I snuck moments reading on Thanksgiving, read before heading to Ft. Worth on Friday. And I finished it instead of dusting and cleaning the house last Saturday just because I could. Gabby will discover what she's made of--and for. Gabrielle Fairbanks knew her husband was upset with her. But she never expected him to change the locks on their Chicago penthouse, cancel her credit cards, and disappear with their two boys. Now she's literally on the streets with her elderly mother, her mom's dog...and $220 to her name. Thank goodness she has somewhere to go--Manna House, the women's shelter where she works. But even in the bustling shelter--surrounded by residents and the Yada Yada Prayer Group--Gabby feels more alone than ever. She longs for someone she can really talk to, someone to help mend together the pieces of her broken life. Her warm-hearted lawyer seems ready to offer more than legal counsel...but is he the answer to prayer or just a pleasant distraction? As her fragile plans fall apart, Gabby hits on a possibility so wild and wonderful it has to be one of those "God things." Something she's only seen happen to other Christians. Until now. For everyone who loves the best-selling Yada Yada Prayer Group novels...The Yada Yada House of Hope series features familiar faces and places, with a fresh new life all its own. In the first book, Gabby kind of got to me because she had some characteristics of a human doormat. As Neta promised me back at the time, Gabby did grow in this book. She becomes a stronger person through all of her struggles and finally stands up for herself. Gabby has a pretty tough go of it, but if I tell you what, I'd mess it up for you. BUT... don't pick up this book without reading the first in the series, Where do I Go?. I think you might get lost. Actually, I would tell you to start with The Yada Yada Prayer Group book one, then 2-7, then start this series to really be in the loop. Having read them all leading up to this one, I knew all of the characters that were in the first series. You could probably just start with this series and be OK because you didn't know what you were missing and Neta fills you in on who everyone is. I can't wait to see how things turn out for her in Who do I Lean on? next summer. And reading the book made me want to go Chicago again. But, as cold as it is here right now, I can imagine what it's like in Chicago and think it would be better to wait for summer. Find out more about Neta Jackson and her books at www.daveneta.com. Thanks for the nice review, Audra! Sure, I'll go up the Sears (now Willis) Tower with you to the new throw-up-your-lunch skydeck. But please wait till LATE spring or summer . . . it snowed today. Uh uh. Ain't gonna do the skydeck thing until it warms up again! Oops, forgot to leave my URL. We're on Facebook, too! Did she just say Cheez-Wiz? I would just like to add, it was my idea!